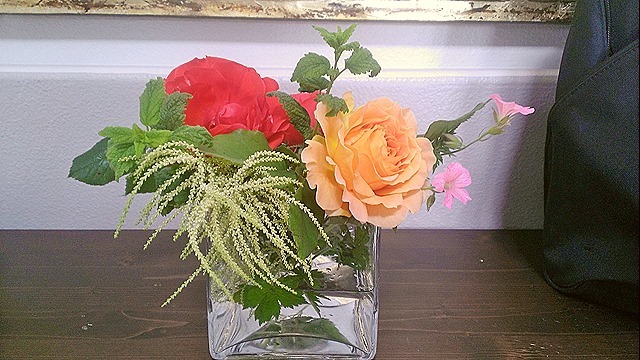 Here is Memorial day flower arrangement. 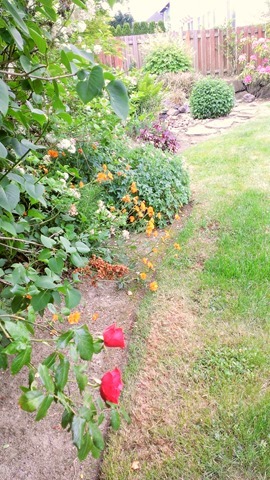 Roses are starting to flower. l picked first yellow of the season along with some goat’s beard and lemon balm. Enjoy! Sammamish is NOT in Idaho, I hope I can still grow potatoes! Being an Indian is enough to express my love for potatoes. We Indians use potatoes in any dish we can cook. Needless to say, when I first came to this country, I was so happy to see many varieties and colors of tubers. 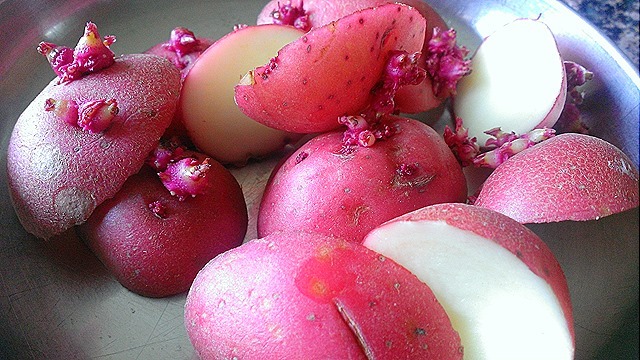 What I LOVE about growing potatoes is – baby tubers aka Dum Aloo. Here are potatoes that are chitting (sending out shoots), I sliced the potato with eyes. remaining potato can be used for cooking. 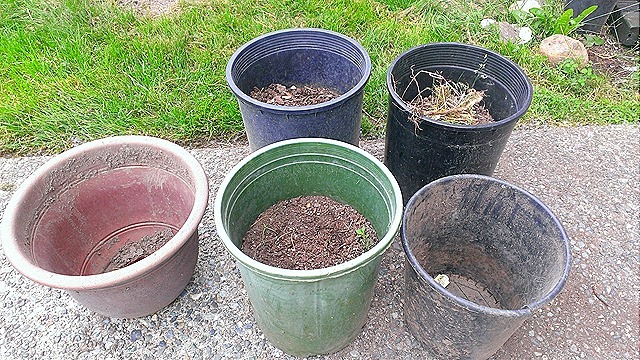 Here are few containers I am using to plant these tubers. This year, I am planting a few in pots and few directly in the ground. Lets see which method yields more. Next, I’ll fill in containers half full with soil and some compost. 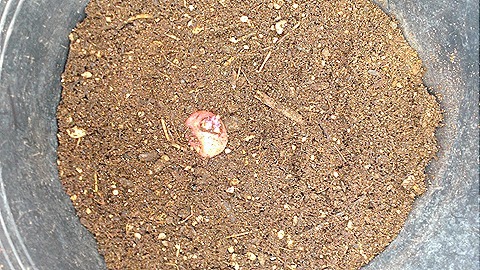 Close up few of the container with potato planted, eye side up and just buried under the soil. 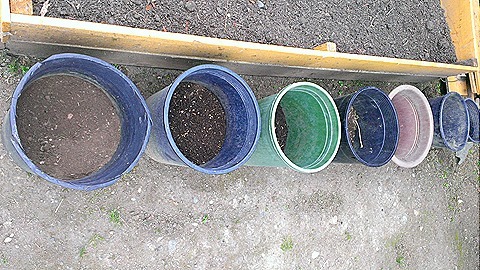 Here are containers with potatoes planted, notice that containers are halfway – or even less – full. Potato plants as they emerge, need to be buried with soil. This hill building will happen throughout next 2 months, buried stems of the plant will bear the tubers. More hilling yields more potato crop. I’ll post few pictures in coming months as potatoes start emerging. As you can see, I have a very late start to gardening this year, hopefully I’ll pick up some speed in coming months. Spring garden is in full bloom right now. Japanese snow balls, geraniums and roses are making an appearance. This is a pretty sight. Gardening is a hobby, not a necessity. Sometimes life takes over, and when life takes over, that is exact the time when one craves for joy and peace it offers. I stayed away from growing, planting, seeding for most of the year so far in 2014 and that translates into very little food supply from garden. We are well within into the spring and this is time for planting for summer and fall. I stepped out the garden and took inventory. My husband has been kind enough to build me new gardening boxes this year. He not only built them but filled them with soil and compost. I am a happy girl. I have saved seeds from last year, I am going to use the old seeds to start new garden this year. Since we are well into the spring, I can really seed anything. To start, I soaked seeds in warm water for 3-4 hours before planting them. This is what I seeded this week: Yellow and green summer squash, Sugar snap and shell peas, carrots, methi, beets, bush beans and spinach. I may be a little late for spinach but I’ll take my chance. I’m waiting for local Fred Meyer to bring out their vegetable starts on sale for this year. I plan to score tomato, pepper, kale and few other vegetable starts from there. Well, even though I was not much into the garden, it kept on giving. I was able to snip chives, mint and oregano here and there. There were 5-6 basket full of kale – which was promptly made into bhaji and daal. While making new boxes, I had to strip out green sorrel – it was 6 baskets of harvest. Hoping for good season of summer growing.